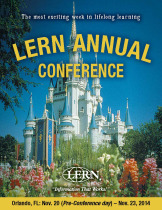 With information not available anywhere else, you’ll find the 2014 LERN Annual Conference to be the most practical event of the year. This conference is an investment that won’t cost money, it will make you money — big money. This year's conference is Nov. 21-23, with pre-conference sessions on Nov. 20, at the Walt Disney World Dolphin in Orlando. © 2014 LERN. All Rights Reserved.